I might be starting a full Glee rewatch (at no particular pace — just in some spare hours), because I feel like it’s taken me this long to really figure out — with your help! — a lot of things about how Glee works, and I might learn a thing or two. Our first lesson is the Spanish verbs ser and estar. Frankly, like a lot of Canadians, I only know the Spanish I learned on Sesame Street. However, knowing a bit more about how Glee operates, I did some research. The difference between ser and estar, which are both translated as “to be”, is that ser is a (reasonably) permanent, essential thing, and estar is a temporary condition. So you’d use ser when you’re describing your nationality, for instance, and estar to describe your state of drunkenness. It made me think of a lot of things, but mostly fan reactions to things we believe to be out of character. I think this lesson holds a lot for us to incorporate about the show, but mostly that there is a lot going on between who a person really is and what is happening to them right now. Rachel Berry may be a star (ser), but her condition (estar) is Lima loser. And in this episode, we hear a lot of attempts at defining the characters. Coach Tanaka tells Finn he’s either a singer or a football player. He can’t be both. Terri tells Will she’s not the cheerleader anymore and he’s not the golden boy. Finn realises at the end that football is just something he does; Glee is who he is. Finn tells Puck and the assorted football players that they are all Lima Losers. That the whole town are Lima losers. Only those who get out are not. Rachel Berry is a star. Not a homophobe. And it’s interesting, because the pilot episode is where we get to meet everyone, but we have a warning at the very beginning of the episode to watch out because not all is what it seems. There are temporary and permanent states of being and we’re going to see both. I think there are a lo of things I’ve missed in those early eps–this is a great find, and a worthwhile, spare-time project! I’m also a Canadian with Sesame Street knowledge of Spanish, so this post has left me a little more enlightened. The set dressers for Glee (or whoever exactly is responsible for things like that) are brilliant. Also, there is a person on LJ who is doing an amazingly detailed episode-by-episode analysis right here: http://four-tens.livejournal.com/ A handful of the season one episodes are done. I haven’t seen this in a long time, so my memory may be off, but here goes: when you take Spanish, which is fairly common in US schools with a language requirement (as a practical matter, Spanish being the most prevalent foreign language here) one of the first things that gets pounded into your skull is the whole ser y estar thing. To quote Joe Biden: it’s a big f**king deal. You can see Mr. Schue at it in that screen cap. But later, when he has April Rhodes in class, he clearly messes that up. You also see him grading papers while happily drunk. “The Spanish Teacher” epiphany didn’t come out thin air. 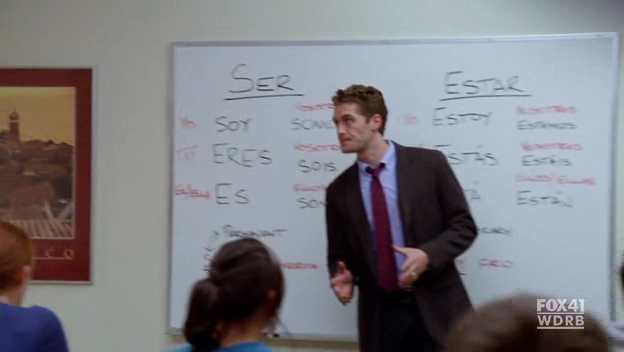 Santana, bless her, was right: he wasn’t a good Spanish teacher because his heart wasn’t in it. His permanent state of being is as a music teacher/musician.